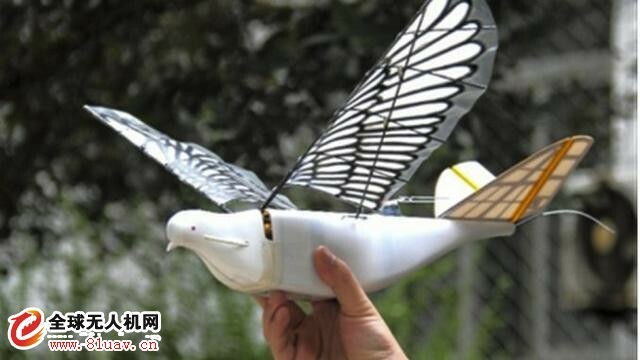 Chinese scientists have develop a bird-like drone. Scientists say the pigeon-shaped drone, which carries GPS and high-resolution lenses, can be used for monitoring and environmental planning. The project, codenamed "Dove", was led by Professor Song Bifeng of the School of Aeronautics of Northwestern Polytechnic University. Researcher Dr. Yang Wenqing also confirmed that the project did exist. However, she pointed out that it was still a small scale of research and development and should be able to meet military and livelihood needs. "Dove" replicates 90% of the movements of real pigeons, making sound, making them harder to be detected, and even attracting other real birds to fly together. 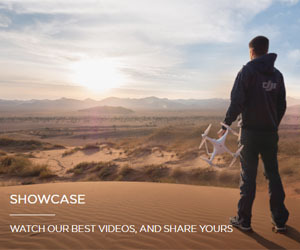 The UAV features high-resolution lenses, GPS antennas, flight control systems and satellite communication function data links, etc. 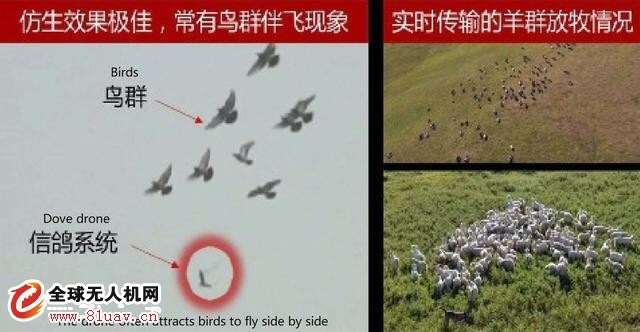 Professor Li Yachao of Xi'an National Defense Science and Technology Laboratory believes that because the action of the "Dove" is so lifelike that it can fool even the most sophisticated radar system, and adding real feathers as camouflage will further interfere with radar identification. The researchers carried out nearly 2,000 test flights, one of which was conducted over Inner Mongolia. The sheep were not even shocked at all. The fidelity was extremely high. The wing was 50 centimeters long, with zero weight, a speed of 40 kilometers per hour and a maximum of 30 minutes. Professor Song also pointed out that although "Dove" have made progress in technology, there is still room for improvement in China's development of the bird-like drone. In addition to being unable to fly long distances or to maintain its paths in strong winds, its effectiveness is also susceptible to heavy rain or snow. In addition, because of the lack of collision prevention mechanism, UAV may collide with objects at low altitude, and the circuits are vulnerable to electromagnetic interference. Even so, as artificial intelligence advances, Professor Song believes the next generation of "Dove" will be able to make independent judgments in the air.